Posted by nrhatch in Art & Photography, Food & Drink, Gratitude, Happiness. How about you? What are your favorite sweet treats? We often have Peperridge (sp) Farm for breakfast. It’s the best. Those photos are good enough to eat. Cake for breakfast is one of life’s little pleasures ~ it just feels so decadent. That is just the perfect slice of cake. Great photos! Coconut cake with lemon curd filling used to be my #1 choice for my birthday cake. Now my top choice is Carrot Cake with carrots, raisins, pineapple, coconut, pecans and cream cheese frosting. I realize it’s early in the morn, but please excuse me while I go have cake and ice cream! Dang, I don’t have either…I guess banana bread and coffee will have to do! I would LOVE a slice of banana bread for breakfast. Haven’t made any in ages. I read your post and then went and bought a chocolate from the vending machine…thank you very much!!!!!!!!!!!!!! I’ll try not to fatten you up too often, Granny! But we all deserve some latitude in our attitude on Fridays, eh? Was it a Mounds bar ~ coconut covered with luscious dark chocolate? Nancy – that’s some amazing food you got going there!! I love me some chocolate in the morning. Chocolate cake, chocolate ice-cream, chocolate donuts, chocolate dip, chocolate chips…. Now, where did I put the damn stuff??!! Andi ~ you might want to check out E’s post on Laduree Macaroons . . . just opened on Madison Avenue. On August 30th, Ladurée opened their first NYC shop on at 864 Madison Avenue and almost caused a mob scene. I have a huge sweet tooth. Hershey’s chocolate is my favorite treat, though. Cheesecake is excellent, too. 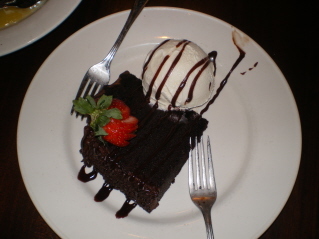 Chocolate has to be my #1 choice of sweet treat. I try to enjoy a nibble or two every day. Last night, I toasted a few Zebra Marshmallows over a candle flame . . . the drizzle of chocolate transforms them. Yum! I’m so hungry now!! After spending the summer in Italy, I’d have to say gelato (the real deal) is my favorite sweet treat. We love gelato, but don’t know anywhere around here to get it. Of course, we have lots of other ways to satisfy our cravings for sweet treats and sticky delights. I was the donut shop sign model. Mocha Gelato, my Mothers Rum raisin bread pudding, dark chocolate everything!! I would love Mocha Gelato. My favorite ice cream . . . coffee heath bar crunch. Thanks, E! When I opened my in-box this morning after posting this . . . the title of your post grabbed my attention immediately. I’m doing Weight Watchers online. I can’t read this post. These days, I eat what I want . . . but always in moderation. 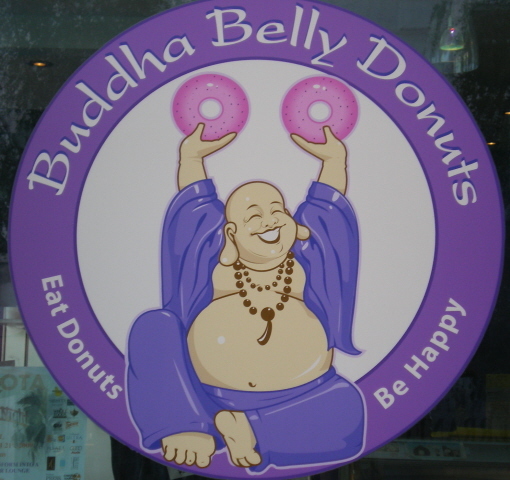 For example, at Buddha Belly, I’d split a donut with BFF rather than eating the whole thing. When we have cake in the house, I let him eat the lion’s share (about 90%) and just have a nibble now and then. Thanks! Oriana’s art is fabulous ~ drinks, cake, ice cream, flowers, etc. I work next door to a Dunkin Donuts–I am not overly fond of donuts anymore. I enjoy Dunkin Donut’s donut holes more than the donuts. My favorite sweet treat? All of them! That cake painting is wonderful. I’ve looked at her work before – she had a pair of ballet slippers that I really liked, too. We don’t have Buddha Belly here. 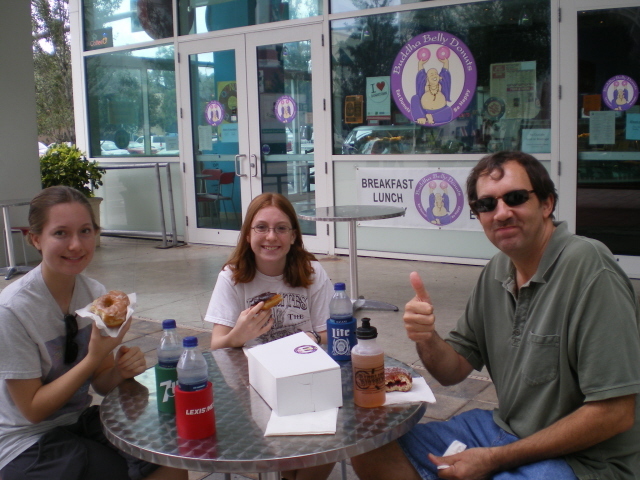 We used to have Krispy Kreme, but most have closed, so I don’t eat much donuts anymore. Buddha Belly is privately owned . . . but it would be great if they franchised. Best donuts I’ve ever eaten . . . the size of footballs. Catch! Seeing Eliz’s article made me smile . . . one of those lovely synchronistic moments when we are reminded that we may share the same muse. I love all of the above goodies but I have recently realized that my favorite thing is pie. Dang I wish I wasn’t too lazy to bake a pie. BFF loves pie, especially fruit pies around the holidays ~ peach, apple, blueberry. There are some Amish restaurants in Sarasota that feature 21 kinds of pie every day. We’ve had Yoder’s strawberry pie. It’s delish!